He may be little, have only one eye, and walks with a limp, but pint-sized Harley the Chihuahua is America’s top dog. Last month he won the American Hero Dog award, and since then Harley’s owners, Dan and Rudi Taylor, have been inundated with calls from around the globe. Each year the American Humane Association’s Hero Dog Awards attract a huge audience of dog lovers from around the country and the world. Eight finalists are chosen in eight categories. Harley won in the Emerging Hero Dogs category for his campaign, “Harley to the Rescue,” which has raised funds and provided medical care for more than 500 dogs from puppy mills over the last two years. Harley is a rescue dog, having spent the first 10 years of his life as a breeding dog at a puppy mill. Like thousands of other puppy-mill dogs, he lived in conditions that left him crippled and broken. Thanks to National Mill Dog Rescue, Harley was adopted by the Taylor family and has become an active spokes dog against puppy mills. 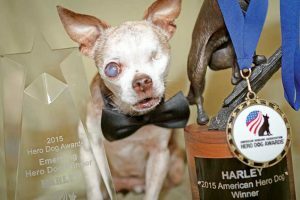 On Sept. 19, at a celebrity-studded event in Beverly Hills, Harley won the American Humane Association Hero Dog Award, making him the official American Hero Dog of 2015. Because of the Hero Dog Award, Harley, “the little dog with the big dream,” is having his story told around the globe, which is good for his cause. “This is an issue that’s going to take so much awareness to make a difference,” said Taylor. The Taylors are utilizing Harley’s Hero Dog status to gain even more publicity for Harley’s message. Harley has even written a letter to President Obama asking for a meeting to discuss “possible solutions to the cruel commercial dog-breeding industry.” You can listen to the entire letter on YouTube on the Harley Taylor channel. Harley, along with Rudi and Dan, will join the American Humane Association in Washington D.C. on Oct. 21 to ask Congress to shut down puppy mills. According to Rudi there are estimated to be 10,000 puppy mills currently operating in the United States, and the she knows this isn’t a simple request. She says there are many issues surrounding the shutting down of puppy mills and, while D.C. may be a hard sell at this time, she hopes to gain ground on the local level in 2016. Municipalities across the United States have banned the retail sale of dogs and cats, including the City of San Diego. With the majority of dogs at retail shops coming from puppy mills, the Taylors know this is a small step toward slowing puppy-mill production. “If this were to happen, it would educate a lot more people about puppy mills,” she added. Colorado’s State Pet is the Shelter Dog, so Taylor thinks it would make sense for Colorado to set an example for other states by banning the retail sale of dogs and cats. "What I really want people to know is that if puppy mills no longer existed there would by 75 percent less dogs in shelters and rescues," said Taylor. "From a dog-lover's point of view, that's absolutely incredible. Also, it would save tax dollars." You can follow Harley’s journey to Washington, D.C. at www.facebook.com/harleyfreighttraintaylor.